Wine was grown in Victoria’s Yarra Valley from the mid 1800’s through to the 1920’s and was a principal export of the new colony. Wine production by the wineries of the Yarra Valley came to a halt in the 1920’s due to the economics of the day, changing tastes and the high price of wool. 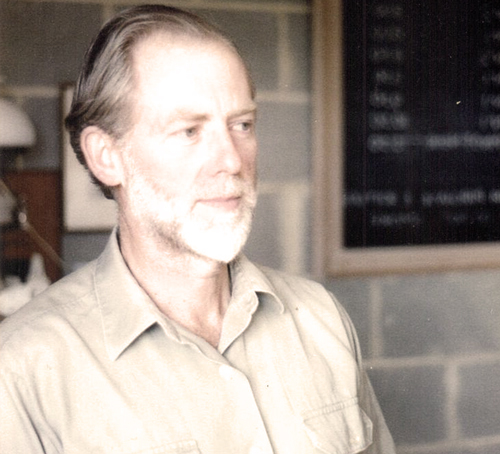 It would need a visionary to re-establish winemaking in the Yarra Valley and in 1969 one came along. 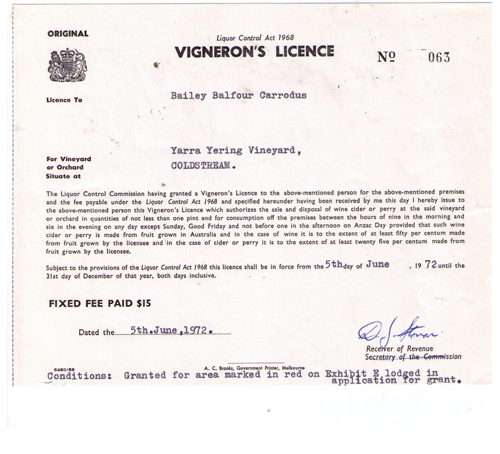 Dr Bailey Carrodus was ideally qualified to become a great vigneron. Having completed his degree in horticulture at Victoria University in Wellington New Zealand, he worked for a time as a scientific consultant to the New Zealand Department of Agriculture. He took a second degree, this time in winemaking at Roseworthy Agricultural College in South Australia, where he also taught for some time before moving on to complete his Doctor of Philosophy for research into plant physiology at Queens College, Oxford University in 1965. Inspired by the elegance and sophistication of the wines he encountered at Oxford, Dr. Carrodus embarked on a study tour of the best vineyards and wineries of France, Spain, Portugal and Italy. Afterwards, he took up a position at Melbourne University and began the search for a vineyard site on which to produce wine in the style he had grown to love. His search brought him to Victoria’s Yarra Valley. Legend has it that for the next few years his students in the botany department made many field trips into Yarra Yalley studying its flora, topography and soils. 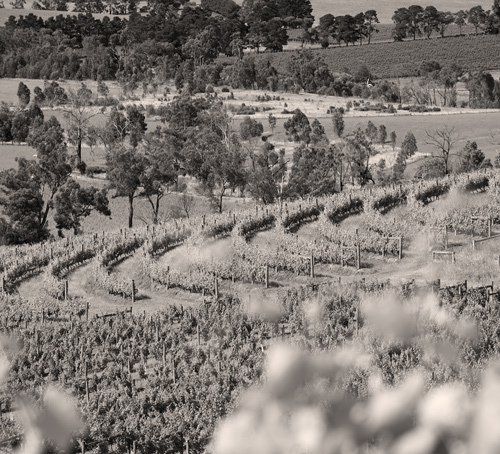 He found his perfect site at the foot of the Warramate Hills and in 1969 began planting. The gentle slope with its northerly aspect and deep grey silty loam shot through with bands of gravel fulfilled all of his requirements. Good drainage, all day exposure to the warm sun, and enough elevation from the valley floor to avoid the spring frosts. He named his vineyard Yarra Yering and in 1973 produced his first vintage of Dry Red Wine No.1, a Bordeaux inspired blend and Dry Red Wine No.2, a northern Rhone blend. 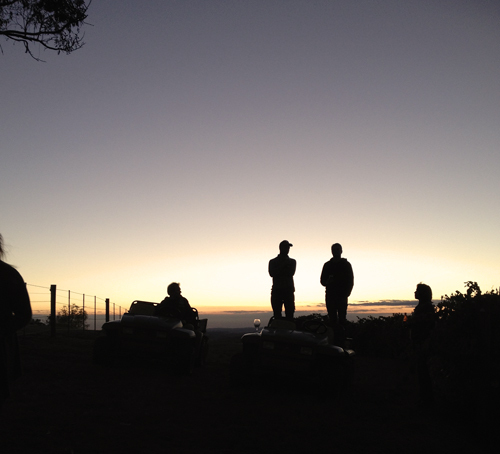 The vineyard that would go on to become one of the best in the Yarra Valley had arrived. 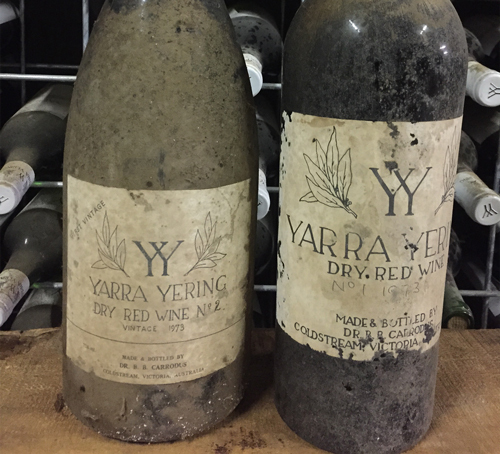 View all our iconic wines on the Yarra Yering online store.